As you can see, I applied a VERY literal interpretation of the inspiration photo to my card. I used a NBUS die from Memory Box called "Cityscape Nightmare." Oh, for goodness grapes, I need my eyes ezamined. It's called "Cityscape Nightline." I die cut the image in kraft, espresso, and pretty in pink paper. Honest, it is PTI kraft card stock; I don't know why it looks like a shade of kackacki green on the screen. Not only that, but the clouds are not black. Honest honest, I followed the color palette. In IRL, the espresso brown and pink and kraft look really pretty together. Ya gotta love trying to post photos on blogs! In order to make my cityscape vertical, I cut all my cuts (what?) into lots of little pieces and then I stacked them up on double-sided tape. Neat, huh? Then I adhered my city to a vanilla card, added the sediment (CTMH), and some "Puffy Clouds" also by Memory Box. 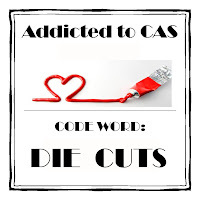 Because I used die cuts, I'm also entering my card in the current Addicted to CAS (Clean and Simple) challenge where the fabulous Loll has chosen the code word of "Die Cuts." 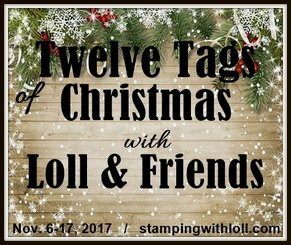 I realized that other partipants might use their cityscape stamps or dies because of the photo inspiration, so before I published this, I popped over to The Card Concept to take a look to see if anyone had done it yet, and sure enough, there is a beautiful card entered by Joyce of Cards-By-The-Sea! You could say I CASEd her! I love how she layered her die cut skyline in the different colors of paper! In Our New Friends Corner, I am so pleased to introduce you to Maria of Maria's Merry Makings! 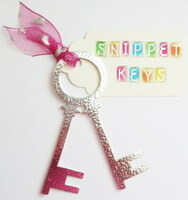 The name tells you how much happiness will be found on her site! Maria is a very experienced card artist who has been blogging since 2010. Her cards are visions of loveliness!! Thank you, Maria, for joining our merriment at the Playhouse!!
. . . My mom said to my dad on their 25th wedding anniversary, "If I'd killed you the first time I thought about it, I'd be out of jail by now." Alycia, I love your mom! That sounds just like something I would say to the Mister! Thank you to all of you for your supportive and entertaining comments! What a great card! Love how you chopped and layered up your skyscrapers-this is such a fabulous take on the inspiration piccy-and the sentiment is beautiful. Fabulous card Darnell. I really love the way you have used that die and another beautiful sentiment. Your cards are always so inspiring. A totally fabulous card Darnell, - Love it. WHat a fun city THIS would be to live in!! Love your colorful buildings Darnell, super cute card! What a great card and I love how you stacked all the die cuts. What a fantastic take on this challenge, Darnell! Love how you've stacked the nightmares to take advantage of that vertical sentiment! Thanks for joining us at the Card Concept! Darnell, I love your stack of sky scrapers. Even though I make nature themed cards all the time I love a pretty city scape and yours is very pretty. Thank you for sending anniversary wishes; it was very sweet of you to remember. Love it!! Also love the previous post too.....a couple of wonderful card! Love the way you did the die on this card. Fantastic! I wish Mr. Linky would let you add multiple cards from one post - I learned my lesson on that the hard way!! LOVE your card! That cluster of buildings is perfectly put together! Oh, what a brilliant idea to cut the diecuts apart and layer them like this! This card is so going into my inspiration folder! But I don't think you CASE'd Joyce's card, you just used the same die to make very different cards - both beautiful! AWESOME COLOR COMBO! This is one seriously fabulous card! The pop of black is stunning with the ligther colors! Clean & layered - absolutely! The "sidelong" sentiment was made for your cityscape (channellling you with that word!) Nice touch with the clouds too! Thanks for sharing your amazing card with us at the first ever CCC! 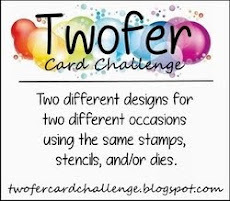 Wowzers this is a great card...love the idea..will have to check out the challenge..my mind is going already..lol...I love coming toyur blog, always makes me laugh and smile....and after the last two days of blogger issues, I need all of that I can get! I love your layered nightmare, I mean nightline. It comes across as pink and green on my screen but if you say it is kraft, it must be so. 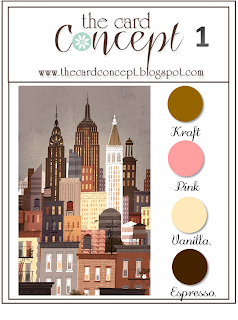 I love how you layered the buildings on this card, Darnell! The vertical design is perfect, too...very cool idea and great color combo! Thanks, as always for making me smile each and every time I visit your blog! Colleen's suggestion is fabulous, and Alycia's mom is 'My kind of gal'!!! What a brilliant way to display the cityscape Darnell - love the tall and narrow design. The sentiment is wonderful and the cute little clouds complete the scene perfectly! Wow! This cityscape is some serious eye candy, Darnell! Love those stacked buildings and that sentiment was made for this card! Thanks again for joining us at The Card Concept. WOW! How fabulous to cut up the die cut to make the side panel Darnell. I love how you have staggered the buildings and the colours. Another gorgeous take on the TCC challenge. Love, love, love the city you built! We are going to have some fun with the new challenge blogs this new year! Darnell pretty pretty card, I love how you were able to manipulate the die cut cityscape to perfect proportions! Thank you so much for sharing with us at the first challenge at the Card Concept! Girl this is beyond amazing!! I love everything about it. I just might have to add this die to my collection:) So glad you joined us for our first challenge..I alway love seeing your creations. Well thats the best use of that die i have ever see its just amazing I love the colors !!!! I want a pink house she said stamping her feet. Darnell your work just gets better and better is that possible !!!!! Thank you so much for the links, giggles and gossip I love coming by. Oh and thanks for your continued support at ATCAS . Love how you used this die to make a cluster of buildings. This card looks fab! Your post are always so full of fun stuff Darnell, that I don't know what to comment on first! haha! The card is fabulous!! Definitely clean and layered and how clever that you cut apart the die cut!! I love it!! I even love the khaki buildings and black clouds! haha! Seriously, I know about this, my colors never look the same on screen as they do IRL! So happy you joined us for the first CC challenge!! Have a great weekend! 'cept that I've done all my dosh for now, but it's definitely top of my wish list. Darnell, this is just fabulous. I really love what you have done with those buildings--and it is way better than mine. I wish I saw yours first. Anyhoo--I'm pinning this one, as I have that Cityscape Nightmare die myself, and am going to try your technique next time. Okay, so while I just admired cityscape stamps and didn't buy any I did tell my Memory Box connection to get me this die... and that was before I saw your card. Love it! And love your mistake on the name. Whoopsie! Holy cow!! I love how you used the die cuts!! Amazing card!! Darnell - I LOVE this stacked city. The effect is FABULOUS! And you made me laugh and wonder what Cityscape Nightmare would look like. Thank you for sharing your lovely sense of humor with us in blogland! Oh that is so neat!! It looks like San Francisco with all the steep hills! So loving those layered dies, gives great depth to your card. Yup. I'd call this clean and layered. Love the way you stacked up that skyline! It rocks! And I multi tasked reading that quote from Alycia - totally laughed and peed at the same time! Too bad about the colors -- I hate that !! I love your city scape....great color too. Love that sentiment! Well done! What a fabulous take on the inspiration pic! I love how you've created your city skyline with your diecuts being cut individually. Thanks for joining us at The Card Concept! Wicked cool! I love how you layered and the colors are GREAT! Awesome card! I totally love the layer upon layer of city dies!! Congratulations on your win today, Darnell. Your design was genius, just wonderful. Since I've not ever seen your designs before I went to your blog and found we have a few commonalities. My DIL's name is also Rachel. The biggest thread though is your wonderful playhouse. Here's my story. My husband and I purchased what we thought would become our retirement home in 2003 in Arizona (where we grew up). Part of that home was a separate house called a "Casita" meaning "small house" in spanish. The size was 247 square feet of sweetness. It had it's own Heating/AC unit, full bathroom and closet. It was pure heaven! We initially used it as a guest house but since we had an inside guest room as well we decided to turn it into my stamping Casita. I LOVED it! But... in 2012 we became grandparents for the first time - something we didn't think would be part of our story. To our surprise and delight we were about to become Nana and BiBi. After much discussion and some tears too, we sold our home in Arizona and returned to our home in northern Virginia (where we had lived for 26 years); my husband is retired navy. I don't have my little Casita but I do have a beautiful sun room with floor to ceiling windows that allows wonderful light in. 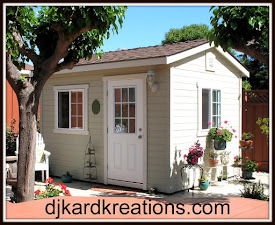 If we ever move again you can bet a little house will be on my list of "must have's." I will certainly visit your lovely blog again. For now, congratulations again on your win. Wow, Darnell, it must take you all day and night to read your comments! Thanks for letting me know about my win! Congrats to you too! I absolutely adore your constructed skyline - I think I need that die! Congrats on your shout out...it is one amazing card!